HAYS, Kansas (Oct 31, 2017)— Jane Soukup, Graphic Design Specialist in Marketing, was recently awarded HaysMed’s quarterly Associate Spirit Award. The Associate Spirit Award recognizes an outstanding Associate who has gone above and beyond their daily job duties to care for a patient, visitor or Associate at HaysMed, part of The University of Kansas Health System. Jane went above and beyond when a family needed help finding the Convenient Care Walk In Clinic. They were from out of town and had come to the main hospital campus. She was just getting off work and offered to have the family follow her in their vehicle to Convenient Care in order to make sure they arrived at the correct location. 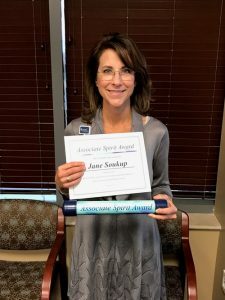 Soukup was awarded the traveling “Associate Spirit Stick”, $50 in chamber checks, and her own Associate Spirit Award parking spot for 90 days.